Back in May of 2009, I installed a neat plug-in to this WordPress blog. The WordPress Download Monitor plug-in allows me to track how many times the free content on Visio Guy gets, well as you might guess, dowloaded. I’m hoping that I will be able to get a better picture of what readers are interested in, and address those topics with more content, tutorials and how-to articles. 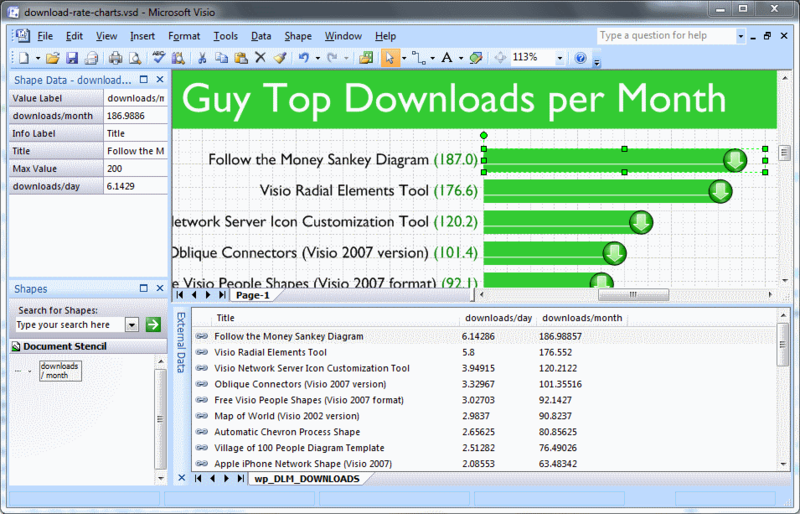 I haven’t linked every single Visio Guy download to the Download Monitor yet, but I’ve tried to pick what I felt were the more popular ones. 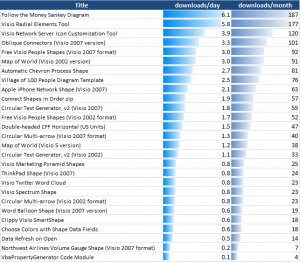 If we look at the top ten downloads, as of November 2009, we see that we mostly have posts that are over five months old! As I so often find when I look at data these days, the numbers are nice, but fairly meaningless, because they can’t be properly compared. When you look at a grand total of downloads, it doesn’t necessarily tell you how popular a download is. It might just be telling you how old a download is, or how well Google and Bing happened to have found it! We can see that there is a nice mix of downloads that have different ages. Now items #1 and #2 haven’t been up for very long and show some skewing in the other direction. Because they are young, hot and on the front page, their per-month projections are warped on the high end. So we should probably throw out at least the first two items from this list. Using the dataphpMyAdmin control panel available from cpanel on my web host, I was able to select some columns from vg2006_DLM_DOWNLOADS and export them to an Excel 2000 format. 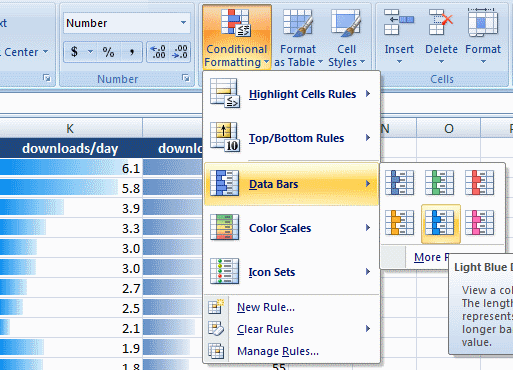 Once I had the data in Excel, I could massage the data, calculate the age of posts in months and days, sort by downloads and downloads-per-month, and even build the “<a href=”” tags needed for the lists above! Now the in-cell bars are nice and compact in Excel, and Excel has a bevy of other graphic capabilities, but I thought perhaps Visio could handles stuff like this too. 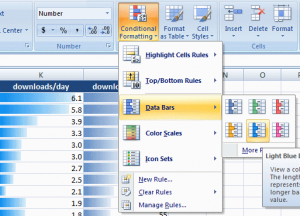 Excel is surely a more adept graphing application than Visio, but with Visio and a bit of ShapeSheet knowledge, you can create custom elements for your bar graphs. Once I had the basic shape working, and the geometry and text linked Shape Data fields, I was able link my Excel data to many instances of it. 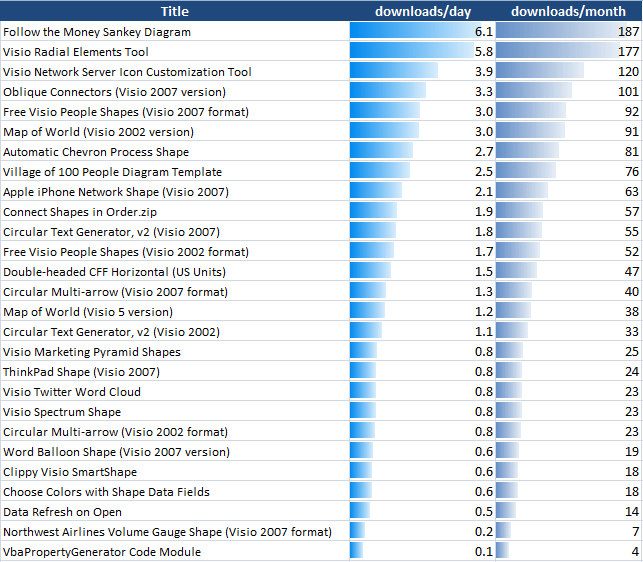 First, I used to use Visio 2007’s Data > Link Data to Shapes… feature to import my download Excel data. Then, I gave the bar shape’s Shape Data fields names that matched the column-headers in that data. This made it easy to automatically link the imported Excel data to the shapes. If there’s enough interest in how I did this (read: LEAVE A COMMENT BELOW!) 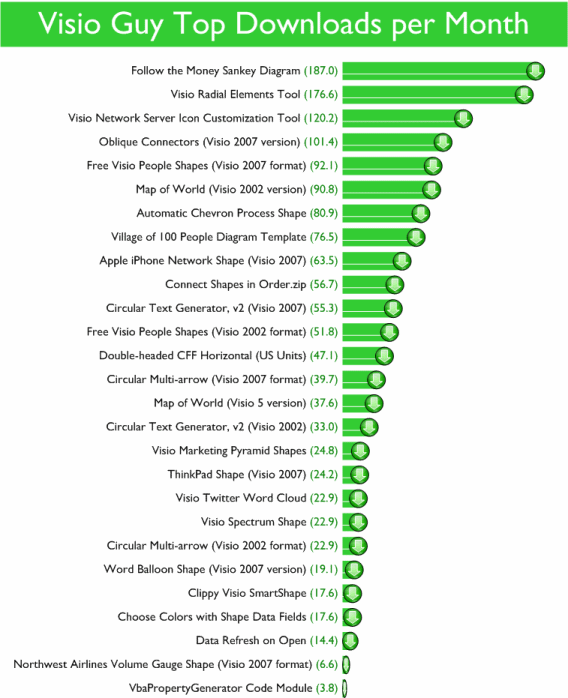 perhaps I’ll talk more about how I created the shapes and linked them to data in future posts. Previous Post: « Kill the Reviewing Toolbar! The large number of download of Sankey diagram stencil is due to the fact that it does not exist on the internet a powerful free sankey diagram editor and the stencil you proposed , at least , help drafting simple diagram. It would be nice to develop more this tool . You’re welcome hitita! Thanks for stopping by and leaving a comment! where do i download this after logging in? 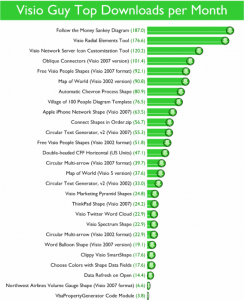 I saw that this post is quite old, but never the less, I’d like to know more about how you finally linked the excel data to the stencil!